The suspect said, “I saw him when I travelled home and observed that he did not go to school. When I inquired about him from my sister, she said his father abandoned him on the claim that the boy usually caused problems. “So I asked if he would come with me to Lagos; he said yes. I brought him to Lagos and enrolled him in a school. 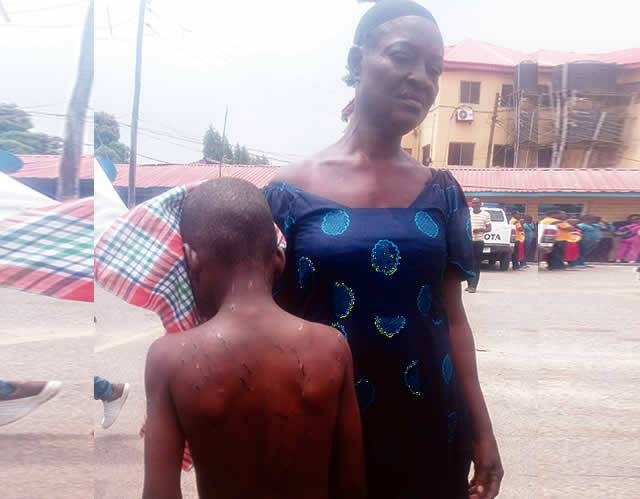 It was gathered that the incident prompted Charity to torture the boy and inflicted injuries on him. The CP, Imohimi, said, “The ordeal of the little boy came to the fore when on May 9, 2018, around 9am, the suspect use horsewhip to flog the child, inflicting injuries all over his body. She thereafter locked him in her one-room apartment with his two hands tied behind his back and left for her shop. CP Imohimi said the suspect would be charged to the Special and S*xual Offences Court as soon as investigation was concluded.